The interaction between the Great Danes and smaller dogs are always hilarious. The pooches do not always realize that they are dealing with someone that is half their size, that’s why all kinds of funny situations will occur. Below, you will see Diesel. He is the boss in the house and a dog with an attitude. This Great Dane will win your heart, but you need to see him together with his friend Miles. They are one of the most entertaining duos around, and the owners know that perfectly well since they decide to record the pair on camera. Ever since Miles was brought home to be introduced to his new family, he started adjusting to his surroundings and exploring everything that is going on around him. This was the time when he met Diesel. 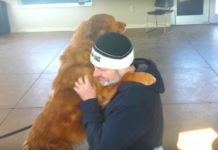 According to their parents, the connection was established almost at once, and now, the dogs share the bond that will definitely make you swoon. The fans of the couple confess that they have never seen a duo that could be compared to the one in the video. However, the atmosphere in the house is not always sunny, especially when Diesel is trying to claim his spot on the couch and receive a sweet treat. The owner is talking to the Great Dane and convincing him that there is nothing wrong with Miles the Chihuahua sitting on the sofa and waiting for the food to arrive, but the pooch won’t listen. He spots his friend having a great time, and this means that he has to interrupt immediately and show his parents that he is the only one who can make decisions.